Books & Fiber: Save the Polar bear! But as you may have seen in the news over the past few days, federal bureaucrats are illegally delaying a decision to protect the polar bear under the Endangered Species Act. Meanwhile they are fast-tracking Arctic oil drilling while the bear remains unprotected! The Center for Biological Diversity and our allies are preparing to go to court to force the administration to finalize the Endangered Species Act listing. But we need your help as well. Polar bears need a massive groundswell of public support to show that people are watching and will not tolerate delays, denial, or political game-playing. 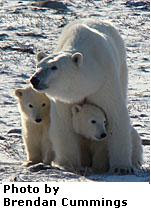 Please sign our polar bear petition today. Tell the Bush administration to immediately list the polar bear as an endangered species. With your help, we'll send the petition with 50,000 signatures to the White House on January 31st. Gepost door Marion op 1/15/2008 08:59:00 a.m.